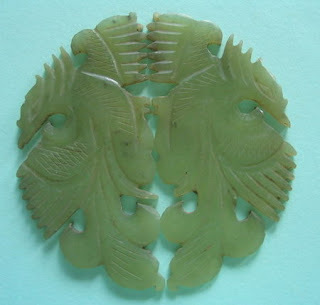 A pair of phoenixes in celadon green nephrite. The phoenix is a mythical chinese animal with very positive associations. It is a symbol of high virtue and grace as well as the union of yin and yang. It appears in peaceful and prosperous times but hides when trouble is near. This is one regal bird ! Look at her cool glance and powerful talons. The strong and deep carving strokes on the jade seem to indicate a Ming vintage. I have wondered about its original use. Was it as some centrepiece in one of those dramatic headdresses such as seen in the TV series War and Beauty ?